Bowser Nightmare is the largest, unlockable board in Mario Party 5, and the seventh and final board of the game. It was created from Bowser's dreams. It is first playable in a simplified variation in Story Mode. If the player defeats Bowser in Frightmare, the full version of Bowser Nightmare becomes playable in Party Mode. When players land on ? Spaces, Bowser appears and causes events that may hinder them. The ? Spaces at the bottom-left and bottom-right sides cause Bowser to come out for a walk to the other side. During his stroll, he turns all Plus Spaces in his path into Minus Spaces and crushes any player in his path, making them lose 10 coins. This event lasts for at least 2 turns, after which the Minus Spaces revert back to Plus Spaces. The ? Space on the top-left and top-right sides of the board cause Bowser to appear on his Koopa Clown Car, where he forces the player to hit a red block or a blue block: one sends the player back to start while the other takes half of the player's coins. The ? 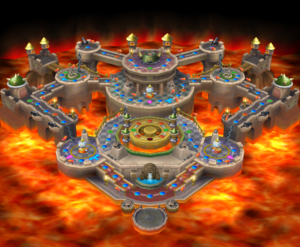 Space at the top of the board causes Bowser to appear and take control of a flamethrower cannon. Players near the flamethrower are burned and lose their Capsules (half of their coins in Story Mode). The two ? Spaces near the circle at the center of the board take players into the circle that Bowser calls "the Spin Stage" (via a red Warp Pipe) where there are Minus Spaces (and possibly Bowser Spaces, due the random placement of Bowser Spaces in this game); Bowser appears for a moment and says "Good luck gettin' out!" to taunt the player. The two ? Spaces inside the circle take players out the circle. This is similar to the Mecha-Blooper ride from Bowser Land of Mario Party 2. If the Last Five Turns Event turns all Minus Spaces into Bowser Spaces, getting trapped in the middle results in a Bowser event every turn until the player gets out. This page was last edited on November 28, 2018, at 00:36.